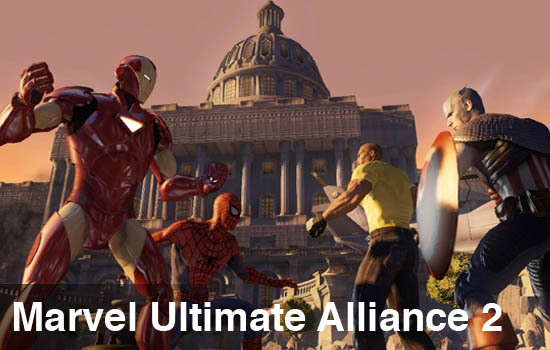 Way back in January, I chose Marvel Ultimate Alliance 2 as my most anticipated title of 2009. The first game was the reason we bought an Xbox 360, and we've played it for hours and hours over the past two and a half years. I am exactly the target audience for this game: longtime comic book reader, RPG fan, and parent of two kids who have similar interests, making the co-op very important. To say that my expectations for a sequel three years in the making were high is a bit of an understatement. 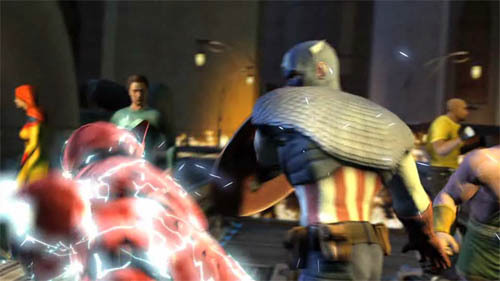 The storyline for Marvel Ultimate Alliance 2 is based on two recent comic book arcs, Secret War and Civil War. The first act features A-listers Cap, Iron Man, Spidey, and Wolverine, led by Nick Fury on a... well... secret war. The fallout from this event, plus a nice cut scene taken directly from the Civil War miniseries, leads to the heroes dividing. One side, led by Iron Man, supports the registration and deputizing of all superhumans. Cap leads the anti-registration forces. This story is quite compelling, and thought provoking. It led to a rather serious discussion with my eight year old son. He was torn between Iron Man and Captain America, and was confused about who was the "good guy". We had a nice talk about citizenship, abiding by the law, and doing what was right. He even made a checklist to help him decide which direction to take. I was very impressed by the storyline, following closely to the comics and initiating a good discussion about some rather weighty issues. The second act of the game is basically spent fighting the opposing side. We chose the pro-registration side, and were tasked with disrupting rebel actions and hunting down Cap and his supporters. We've not made it to this stage of the game in our second playthrough, but I am sure the second act plays totally differently if you choose anti-registration. Some characters only unlock costumes on one side or the other, which also adds some replayability. I was a bit surprised to see that only three characters are off limits when you choose sides. I'd have expected the roster to have been more split, but playability took priority over comic accuracy in this case. I can't fault that decision. While the story starts off quite strong, it tapers off rather quickly. I'm sure it won't be much of a spoiler to reveal that a larger threat comes in and unites the heroes, etc. etc. At this point, the narrative gets fairly mundane. In fact, the story at this point becomes quite a bit like that of Spider-man Web of Shadows. With the loss of tension due to the Cap vs. Iron Man struggle, the game flounders a bit, and becomes more predictable. Still, the story is much more memorable than the "kitchen sink" approach of the first game.